Contains: 7/8", 15/16", 1", 1 1/16", 1 1/8", 1 3/16", 1 1/4", 1 5/16", 1 3/8", 1 7/16", 1 1/2", 1 5/8", 1 11/16", 1 3/4", 1 13/16", 1 7/8", 2", 2 3/16" sockets, Reversible Ratchet Head, Handle, Flex Handle, Sliding T-head, and 4" , 8" & 15-1/2" Extensions. This 15 piece < in and 3/8 in Drive Tool Accessory Set is portable and can easily be transported between work areas. This set features a removable inner tray designed to fit in most tool chests with standard height drawers. This set is part of a full storage solution under the DEWALT brand that contains other interlocking stackable sets giving a user freedom to customize and carry their tools. The Husky Palm Ratchet is great for use in tight spaces it's 72-Tooth internal gear needs only 5 in. to engage fasteners. This set comes with 12 commonly used SAE and Metric 3/8 in. drive sockets a 3 in. extension bar for added reach. The bit adapter enables the included bits to be used as bit sockets offering the versatility of 15 with just 1 socket. 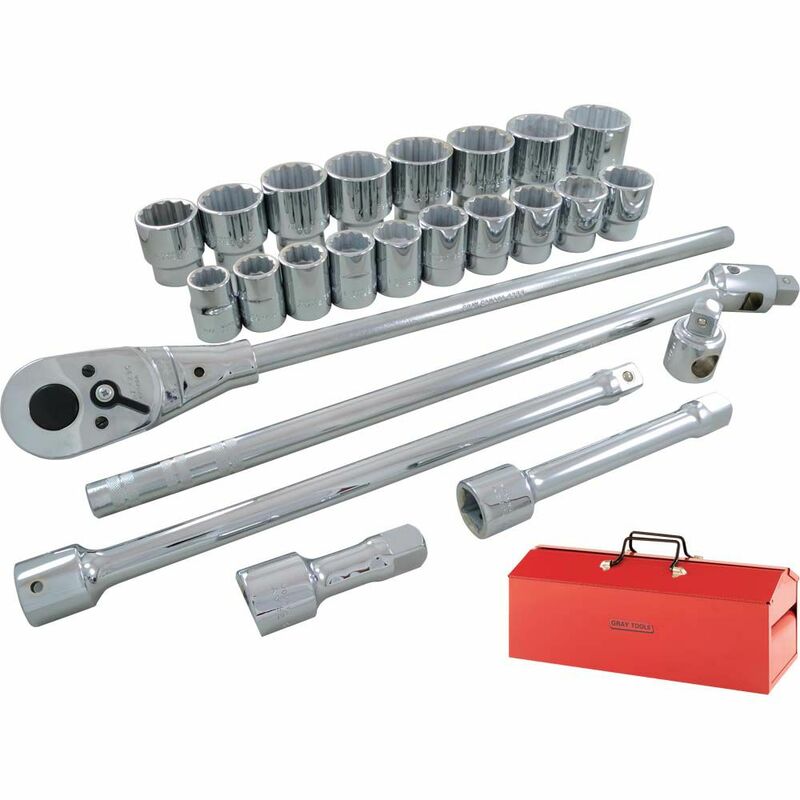 Socket & Attachments Set 26 Pieces 3/4 Inch Drive 12 Point Standard Sae The sockets and attachments in this 26 piece 3/4" drive SAE 12 point standard set feature outstanding corrosion resistance as a result of our proprietary in-house plating process. Each socket is made from premium tool steel for maximum durability and has a distinct brilliant jewellery-like finish. Includes a high torque ratchet and rugged metal toolbox. Made in Canada and backed by Gray Tools worry-free lifetime warranty.